My name is Lisa. I am a mom of a 3 year old and one year old boys. I am a hairstylist and stay at home with my children. My jewelry shop has helped keep our family afloat as my husband just graduated from college and in now trying to get into a career. It will be my turn to finish college soon! I blog about my adventures, as well as business tips at Little Lovables. My father had Leukemia growing up (he passed away 6 years ago), so I was practically raised in hospital rooms. To keep entertained during those long and emotional days, our family did crafts together. We all still do, my mom, sister and aunt even have Etsy shops! 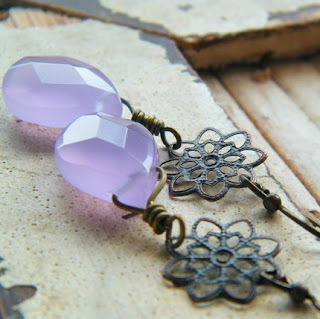 I started on Etsy with another shop http://www.littlelovables.etsy.com/ making tutus, puppets, collage art and felt accessories, but really loved the look of vintage jewelry and was totally drawn to it. I took a metalsmithing class several years ago and make a beautiful bracelet, so I thought I would give jewelry a try. I hope to learn metalsmithing again someday. I lent a beautiful necklace to a friend, whose little son cut it up, I decided to learn to fix it and got totally addicted to making jewelry. 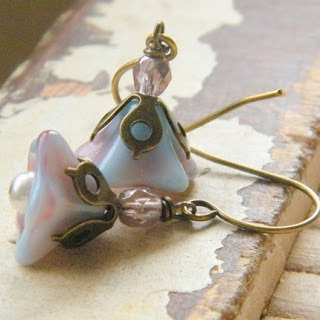 I make jewelry mostly out of vintage pieces, stones and freshwater pearls. Many of them are new old stock (vintage but never used) or new pieces created from vintage presses. 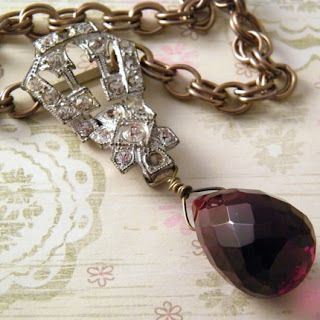 I also visit antique shops searching for vintage jewelry to cut apart and reuse. I love cottage, shabby chic, Victorian and Tudor styles, so that is what I focus on in my searches. I just celebrated my one year anniversary of my jewelry shop in January 2009! History, novels, music, movies, my family, cultures. I love theatre and period costuming. I did a little theatre a long time ago, and while I loved acting, I also helped design sets and some costumes. At The Paul Mitchell School, we were taught to find inspiration in nature, our moods, everything! I love things that are timeless, elegant, romantic, but a little bit urban, organic and grungy at the same time. I feel perfectly fine wearing dangly rhinestone earrings with a fitted tshirt and a great pair of jeans. 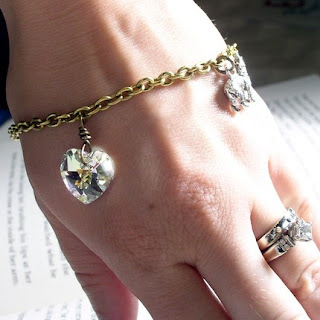 Jeweled Ambrosia has generously offered one of my readers their choice of either The Garden Fairy Earrings OR Bella’s Twilight AB Swarovski Crystal Pewter Wolf Bracelet (for all you Twilight fans out there! ).